The Hen Harrier Hotline is open! As spring arrives we’re asking you to keep your eyes to the skies and you may even spot some skydancing! Project Manager Dr Cathleen Thomas tells us how you can help us to protect hen harriers. Hen Harrier LIFE project Community Engagement Officer Roisin Taylor reflects on her experiences working with gamekeeping students and finds reasons to be optimistic about the future of England’s hen harriers. Another hen harrier, Vulcan, has now sadly joined the ‘missing in action’ list. What is the RSPB doing to protect hen harriers? Earlier this week, Hen Harrier LIFE Project Manager Dr Cathleen Thomas took a look at how the UK's hen harriers had fared in 2018. Now she gives an overview of some of things that the RSPB is doing to help them. As we reach the end of 2018, Hen Harrier LIFE Project Manager, Dr. Cathleen Thomas, looks back over the year. In November we reported that a rare hen harrier had disappeared in North Yorkshire, triggering an investigation by the police and the RSPB. This was the ninth bird to disappear in suspicious circumstances in just 12 weeks. Dr Cathleen Thomas, Hen Harrier LIFE Project Manager, reports on the sudden disappearances of four more tagged hen harriers in Scotland in suspicious circumstances. Following our recent blogs on the suspicious disappearances of Hilma, Octavia, Heulwen and Thor, I’m deeply saddened to report the suspicious disappearances of a further four birds in Scotland: Athena, Margot, Stelmaria and Heather. This summer we were overjoyed to have hen harriers nesting in Bowland for the first time since 2015. Our project team worked round the clock to monitor the three nests there, and the parent birds fledged an amazing 13 chicks between them. Dr. Cathleen Thomas, Hen Harrier LIFE Project Manager, introduces the new cohort of tagged hen harriers for 2018. We were overjoyed this summer when we tagged an unprecedented amount of hen harrier chicks across the UK. The team hiked over bogs, moorland and mountains, often during heat wave conditions, to locate the nests and used their specialist expertise to fit lightweight tags to each feathery bundle. Dr Cathleen Thomas, Hen Harrier LIFE Project Manager, reports on the sudden disappearances of three more tagged hen harriers in England and Wales in suspicious circumstances. You’re both keen birders. What’s been your best ever birding moment? Earlier this month, Les Wallace launched a Government petition calling for an independent review of the economics of driven grouse moors. Our Head of Nature Policy Gareth Cunningham explains why we are calling for a full independent inquiry that not only looks at the economics of grouse moor management but also the role of regulation in the industry. On the 25 August Natural England published the raw data from tagging 158 tracked individual hen harriers. Publication of this data is something which the RSPB has previously called for. As the breeding season draws to a close, we take some time to reflect on the breeding success of hen harriers in England in 2018. Hen harrier numbers have been declining steadily in England over the past few decades. It is well known from independent research that the main reason for this decline is illegal killing of these birds associated with driven grouse moor management in northern England. Today we have a guest blog from Dara McAnulty, the young Fermanagh naturalist, who reminds us that there's always something we can do to help hen harriers. I remember the first time I wittingly saw a raptor, I was five and I became entranced. The RSPB visited my school soon after to talk about red kites and the fascination grew into obsession. I constantly scanned the skies for a glimpse of majesty. Hen harriers are in trouble – that’s not news to anyone. The RSPB continues to urge the government to crack down on illegal persecution in the uplands in a bid to give these birds a chance to re-establish a stable population in England. Last month we reported that hen harriers had bred successfully for the first time in the Forest of Bowland since 2015, with two nests, both containing four chicks. Shortly after, the final egg on the second nest hatched very late, making it five. Now we can reveal there is a third nest on the United Utilities Bowland estate, boasting four male chicks. Recently, it’s been one bad news story after another on this blog with many reports of our satellite-tagged hen harriers disappearing in unexplained circumstances. So, it makes a nice change to give you some good news. I’m delighted to report that, for the first time since 2015, there are hen harrier chicks at Bowland in Lancashire. Today we have a guest blog from Findlay Wilde, a 16 year old conservationist, ringer, birder, environmental blogger and campaigner. Findlay is working hard to protect nature, and raise awareness about hen harrier persecution. Dr. Cathleen Thomas, RSPB’s Hen Harrier LIFE Project Manager explains that today we have more sad news about another bird, this time from the Hen Harrier Class of 2016. 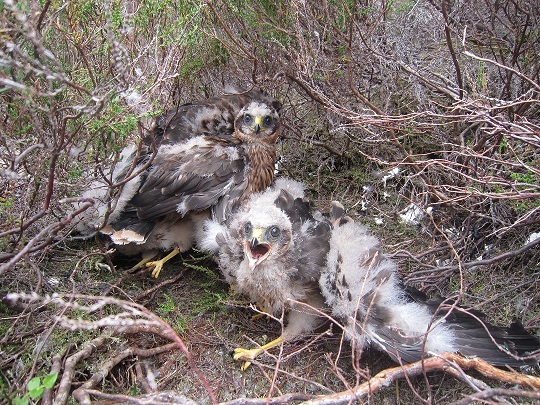 RSPB Investigations Liaison Officer, Jenny Shelton, sheds more light on the disappearances of two hen harrier siblings, Marc and Manu, in similarly unsettling circumstances.